This is how it is in writing a book, take an example to climb the mountain, there is only one way to climb a mountain? step by step. Now think of writing your ebook ( book ) in the same light. You must create it step by step, and one day, you will take that last step and find yourself standing on the summit with your head in the clouds. The first thing you have to do as if you actually were a mountain climber, is to get organized. Instead of climbing gear, however, you must organize your thoughts. There are some steps you should take before you begin. Once you’ve gone through the following list, you will be ready to actually begin writing your ebook. First, figure out your ebook’s working title. Jot down a few different titles, and eventually, you’ll find that one that will grow on you. Titles help you to focus your writing on your topic; they guide you in anticipating and answering your reader’s queries. Many non-fiction books also have subtitles. Aim for clarity in your titles, but cleverness always helps to sell books ? as long as it’s not too cute. For example, Life After Forty: Twenty Different Ways To Make Money Fast. Or: Get Started Now Living The Good Life: Fifteen Exercise Plans To Whip You Into Shape. All chapters spring forth from your thesis statement. Once you’ve got your thesis statement fine-tuned, you’ve built your foundation. From that foundation, your book will grow, chapter by chapter. 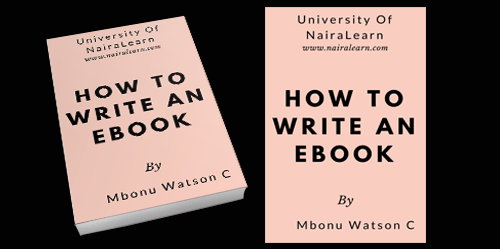 Your thesis will keep you focused while you write your ebook. Remember: all chapters must support your thesis statement. If they don’t, they don’t belong in your book. Another Important Step: is to figure out who your target audience is. It is this group of people you will be writing to, and this group will dictate many elements of your book, such as style, tone, diction, and even length. Figure out the age range of your readers, their general gender, what they are most interested in, and even the socio-economic group they primarily come from. Are they people who read fashion magazines or book reviews? Do they write letters in longhand or spend hours every day online. The more you can pin down your target audience, the easier it will be to write your book for them. Then write down your goals in terms of publishing. Do you want to sell it as a product on your website, or do you want to offer it as a free gift for filling out a survey or for ordering a product? Do you want to use the chapters to create an e-course, or use your ebook to attract affiliates around the world? The more you know upfront, the easier the actual writing will be. You must figure out how to keep your writing engaging. Often anecdotes, testimonials, little stories, photos, graphs, advice, and tips will keep the reader turning the pages. Sidebars are useful for quick, accessible information, and they break up the density of the page. Break up the length and structure of your sentences so you don?t hypnotize your readers into sleep. Sentences that are all the same length and structure tend to be a good aid for insomnia! Good writing takes practice. It takes lots and lots of practice. Make a schedule to write at least a page a day. Read books and magazines about the process of writing, and jot down tips that jump out at you. The art of writing is a lifetime process; the more you write (and read), the better your writing will become. The better your writing becomes, the bigger your sales figures. In an ebook that is read on the screen, be aware that you must give your reader’s eye a break. You can do this by utilizing white space. In art classes, white space is usually referred to as “negative space.” Reader’s eyes need to rest in the cool white oases you create on your page. If your page is too dense, your reader will quit out of it as soon as their eyes begin to tear. Use at least one and a half line spacing, and text large enough to be read easily on the screen, but small enough so that the whole page can be seen on a computer screen. You will have to experiment with this to find the right combination. 0 responses on "HOW TO WRITE AN EBOOK"